Hot and Quiet Here But the Tropics are Heating Up - Bonnie??? 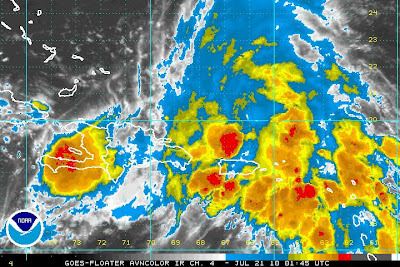 This is what's brewing in the Caribbean. Not that impressive looking but what is now 97L should become TD #3 and then TS Bonnie within a day or so. NHC statement after the picture. Meanwhile, here in Hell the heat continues unabated. It will gradually warm up the rest of the week - it'll be around 100 this weekend - more "seasonal" temps around 90 next week. I'll take it. Keep you updated when/if Bonnie officially forms. As it stands, looks like she'll take a westerly track towards S. Florida. EXTENDING FROM THE NORTHERN LEEWARD ISLANDS WESTWARD TO HISPANIOLA. WEST-NORTHWESTWARD AT ABOUT 10 MPH DURING THE NEXT DAY OR SO. TROPICAL DEPRESSION OR A TROPICAL STORM DURING THE NEXT 48 HOURS. The opening salvo to the 2010 Hurricane Season did not disappoint ! 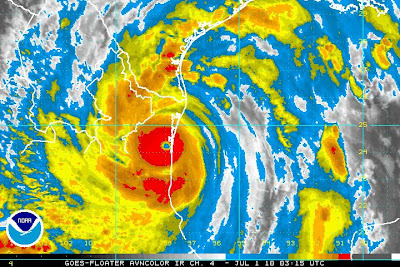 Hurricane Alex made landfall tonight as a strong Category 2 Hurricane, packing sustained winds of 105mph with higher gusts and a min pressure of 947mb. Category 2 winds are between 96-110 mph on the Saffir-Simpson scale, so it was close to a Cat 3 (111-130mph). As it moves west into mountainous terrain Alex will weaken rapidly and dissipate. Main threat now is flooding, up to 20 inches possible if/when it stalls. Stay tuned for the next one.